Each month as part of this series from the AAS Historical Astronomy Division, an important discovery or memorable event in the history of astronomy will be highlighted. 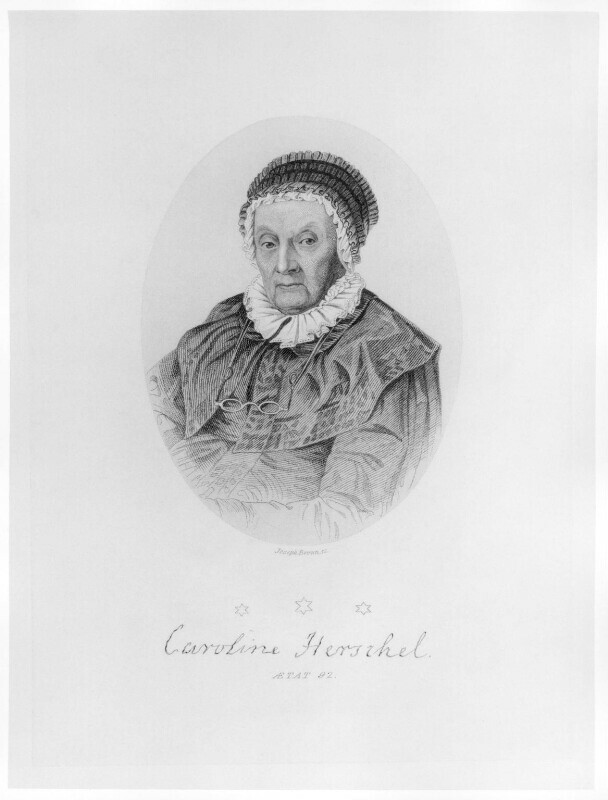 This month, we focus on the contributions of astronomer Caroline Herschel. Standing at just 4 feet 3 inches under her brother’s looming 40-foot telescope, Caroline Herschel's physical stature parallels that of her prominence in the history of science: often overshadowed by the accomplishments of her brother William. William Herschel is best remembered for his discovery of Uranus, detailed star and nebula surveys, and discovery of infrared radiation, whereas Caroline, his life-long aide, helped him by creating detailed transcriptions of his notes and making painstaking calculations. William is remembered as one of the great British astronomers of the eighteenth century, but historians sometimes appear at a loss when it comes to accounting for Caroline's contributions. Although she was indeed an attendant to her brother, documentary evidence reveals that Caroline had her own interests and distinct talents. This is most notable in her proclivity for comet-hunting. While William was away on holiday or preoccupied with business matters, Caroline used the "comet sweeper" her brother had given her to search the sky. Between 1786 and 1797, she discovered eight comets, at least five of which were never before documented. She published her findings in the Philosophical Transactions of the Royal Society, a practically unheard-of accomplishment for women at the time. She was the first woman to be named an Honorary Member of the Royal Astronomical Society, and when she was officially hired by King George III as her brother's assistant, Caroline arguably became the first woman in Britain financially employed in a scientific pursuit. Although her comet-hunting prowess prompted encouragement from several elite scientists, including the Astronomer Royal, Rev. Dr. Nevil Maskelyne, she also faced mockery for her contributions to a male-dominated field. 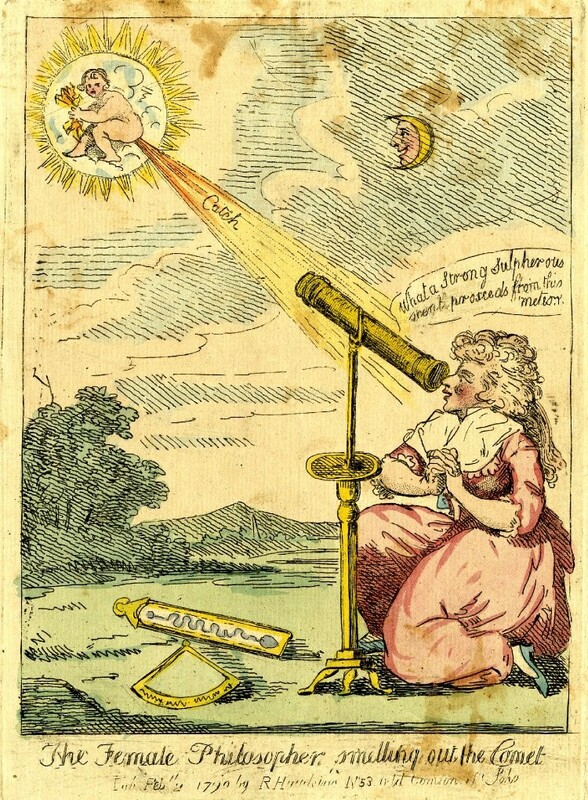 Figure 2 is a satirical cartoon published shortly after Caroline discovered her third comet in 1790. Titled "The Female Philosopher, smelling out the Comet," it depicts a woman (presumably Caroline) admiring a "comet," represented by a putto1 overcome with flatulence (creating the comet's tail). The woman exclaims, "what a strong sulpherous scent proceeds from this meteor." Such a callous representation diminished the technical skill required for comet hunting, and is indicative of early modern attitudes towards women in science. Caroline was aware of the limits imposed upon her gender. In one of her many letters to Maskelyne, she lamented, "You see Sir, I do own myself to be vain because I would not wish to be singular, and was there ever a woman without vanity? – Or a man either? Only with this difference, that among gentlemen the commodity is generally styled ambition. "2 Here Caroline points out the double standard which some might argue lingers to this day: ambition in a man is laudable, while the same attribute in a woman is considered a character flaw. How, then, to remember Caroline Herschel? She was both an assistant to her brother and a scientist in her own right. And while it might be true that "great" women in eighteenth century science often achieved recognition through proximity to "greater" male figures, this observation is rooted in the history of social and institutional gender barriers. Such insight offers the potential to apply what we can learn from history to the present. 2 February 1790. British Museum, London. 1 Putti (plural) is an art historical term for depictions of babies or cherubs, very commonly found in Renaissance and Early Modern artwork. 2 Correspondence, Miss Herschel to Rev. Dr. Maskelyne, Sept. 1798.